I rocked forward, balancing my book on my knees and tried to ignore the yelling and chatter around me. The edge of the cafeteria bench dug into my legs, practically cutting off my circulation, but I barely noticed. “Uh-huh. Just one more page…it’s getting good.” I flipped the page. Maeve was about to be transported to the Otherland and the court. “God, you are a freak.” Em heaved a dramatic sigh and turned to talk to the rest of our tablemates. Yes. This was it. It was like magic jumped off of the page and into my fingers, travelling straight to the pit of my stomach. Aedan. The words rolled over me and the cafeteria faded away. Aedan held out his hand, waiting, his gold-flecked eyes meeting hers, making it impossible to look away. Even though Maeve was dying to reach out and wrap her fingers around his, she hesitated. The whole situation was insane. “Trust me…”I whispered along with him and my heart skipped a beat. “What the hell?” Em broke into my thoughts and I jolted back to the cafeteria and caught sight of a guy a few tables over trying to stuff an entire hoagie into his mouth. God, reality sucked. “Normalcy is what keeps us afloat in this sea of teenage drama,” Em said in her best authoritative voice with a dramatic toss of her short, dark curls. Without missing a beat, she managed to seamlessly pop back into her conversation with Grace and Alec. We were like four legs on a wonky table. Em and me, the band geeks…I was the bookish one to balance her drama nerdery; Alec, the sciencelete; and Grace, our resident cheerleader. Most of us, like me, kinda flew somewhere below popular and above total nerddom. Grace, with her blown-out strawberry blonde hair and designer wardrobe, was a part of the glitterati but still deigned to sit with us nobodies. If she hadn’t been a sciencelete with Alec before making the squad, she probably wouldn’t even know our names. Instead, she was the voice of reason to balance Em’s theatrics, Alec’s geekiness, and my tendency to quote fictional characters. And Em and Alec, who had grown up next to each other, were the glue that held us all together. I unpacked my sandwich and resigned myself to the fact that I’d gone from living in a world of ancient magic to lunchtime mundane. Grace was still wearing her red and orange uniform from the pep rally that morning, and even her color coordinated, beribboned ponytail screamed school spirit. “That’s assuming our team even manages a touchdown against Millbrook. Their offense has a spread-passing attack that dominates the field and their defense has given them five shutouts this season. I doubt you’ll be playing any victory marches tonight.” The words that came out of her mouth sounded like they made sentences, but I wasn’t really sure what they meant. Em elbowed me. “Did you understand anything she just said?” Grace sometimes forgot that Em and I routinely failed the football module in gym every year, which was kind of impressive considering we were forced to sit through all the home games for credit in band. “Because archery is so much like football. If someone starts running at me, I don’t try to jump on them. I shoot them.” I anchored my hand alongside my chin and shot her with an imaginary arrow. Out of the corner of my eye, I saw Em mouth, “Here we go again,” to Grace. I blinked dumbly at him. Dev usually sat on the other side of the lunchroom with some of the other theatre and band people, but this was the fifth time this month he had just showed up at our table. “We were until Feebs started going off about glasses and stuff,” Alec told him around a mouthful of hoagie. “If the world were a book and my glasses were melted by a glittery dragon, I’d be screwed,” Grace said in a high-pitched mock imitation of me. “Normalcy is definitely overrated,” Dev said, and I wondered if he had heard my earlier conversation with Em. Before I could ask, though, he looked past me and started a long, boring discussion about Perfect Zombieism and something about decapitation with Alec. I let their voices blur together and thought about pulling the book back out of my bag when Kris passed our table. Kristopher Lambert. Junior class president and an exact match to the mental picture I had of Aedan from Golden. Well, if Aedan was real and not a creature out of Irish legend. Tall, aristocratic features, almost black hair that was always neatly combed into place, and golden brown eyes that I could look into forever. Time slowed and, for a second, only he and I existed. I let out a silent sigh, trying my hardest not to look like the girls who mooned over the football players. With an awful thud, time sped up again. “He’s our class president and incredibly smart,” I shot back at her, then dropped my chin into my hands and refocused on Kris, who had put on his campaigning expression and was talking to some of the guys from the football team. 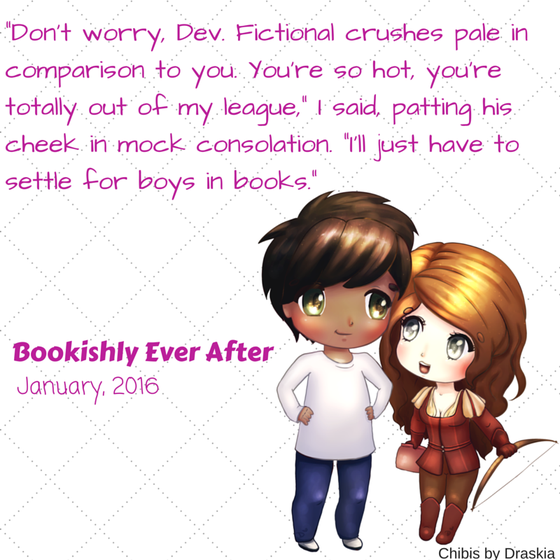 “... and looks like a fictional hottie.” Em finished for me. “What about real hotness? You know, like five foot ten of this?” Dev asked, pointing at himself and posing as if he were waiting for someone to take his picture. “My name does mean ‘god’ in Hindi,” he added, winking a greenish-hazel eye at me. Between his athletic build, those eyes, and the straight black hair that kept threatening to fall into them, he definitely qualified as one of the cuter guys in our class. Half of the girls in the band and, if Em was to be believed, the drama club, were in love with him. But he was just so…Dev. He’d seen me freak out over the giant spider in the band room and geek out over the book fairs in middle school and I’d seen him in his ridiculous band uniform cleaning spit out of his clarinet one too many times.